The daffodils are in bloom, the hills are turning green, and I'm ecstatic to get up in the morning—it must be spring! But wait... it's only mid-March. What happened to the worrisome tail end of winter? That last snow that ruins my spring planting and keeps my heart rate up all the way to April? Is it possible that we might have a long, lovely, gentle spring?? Seems almost too good to be true. Well, to be fair there are some drawbacks to an early spring, and there are some foreboding trends. Here's a recap of some of the best parts of this march and some of the scariest. We actually got our first successions of brassicas (broccoli, cauliflower, kale), potatoes, and sugar snaps out in the field before the 1st of April. This bodes well for a long luscious veggies season! Spring fever is upon me already—it feels like there's a million things to do and I'm running in every direction. BUT, unlike many springs, this year it's starting so early that I may actually have time to do many of the things I need to before market season is fully underway. My gas bill is down and so is my stress level. It is a real gift not to have to worry quite so much about the baby seedlings at night. The flea beetles are already here :( . Last year I got at least two clean successions of greens out of the hoop house before bug fever. This year the first babies haven't even finished getting their full leaves and the little buggers are all over them! ARGHHH! The wind is outrageous (to be fair this happens every spring—but I hate it every spring!). The hoop houses are billowing frighteningly and the little baby seedlings are over stressed and none too happy about it. Nonetheless, at the end of the day I'm feeling very lucky. The days are getting longer and the warm sun adds a welcome lift to my step. So, regardless of what the future holds, I'm going to do my best to live in the moment and relish this beautiful early spring! There aren't a lot of Organic vegetables farmers in Botetourt County. Actually there are no other certified organic growers in this county. There are a few if I look farther south and east and certainly if I go all the way north toward northern Virginia there is a strong network of organic growers. But, sharing with peers even 50 miles away feels prohibitive most of the year. For the most part I cling to my friends at Patchwork farm and rely on phone calls to ME and my former colleagues at Six River Farm—this strategy leaves something to be desired in terms of a "peer group". So, imagine my delight this winter when I was introduced to the land of Facebook groups (I know, I am woefully behind the times). Before personal introductions from farmer friends I didn't actually know that there was a use for Facebook beyond marketing and social exchange. But now, guess what—I've been invited to not one but TWO groups specifically designed to cultivate peer learning and sharing in the organic market farming community. Sweet! Women in Sustainable Agriculture is a general group of ladies all over the country sharing information about a wide range of farming topics—from bee hive heath to effective marketing strategies etc. Four Season Farming is designed for experienced growers operating year round (I am very intimidated by this group—they are really amazing farmers). It is led by the impressive Michael Kilpatrick. In just the short time that I've been a member, I have already learned so much from these two new communities. Here are a few of the more interesting topics I've been working on with help from these groups. The new hoop house leaks! How annoying. I spent all of this money and energy trying to get a safe (DRY!) space for more early spring and winter crops only to find out that the house leaks.. It leaks in from the ground (the site isn't very level) and it leaks from the hip boards that run along the sides of the building. I shared this information with my new peer groups and learned a few things. 1) I need to build more effective drainage pathways to lead water away from the building (done!) and 2) it seems likely the side leaking is coming from damage in the plastic from the wiggle wire. I can patch this both with repair tape and silicon. Annoying, but fixable. How to manage irrigation in the hoop house? Each of our houses has 6 beds, or space for three successions of salad greens. I use a mini wobbler irrigation system that has been very effective, it can water the whole house at once and does it very evenly. However, it is hard to manage the breadth of their spread when I haven't planted all six beds. For instance, in this first planting I'd like to limit the irrigation to just two beds so that the other 4 are dry enough for cultivating and preparation. So, I asked my new online friends how they manage this issue. Responses were interesting, mostly people opt for an overhead irrigation system in hoop houses. I was also reminded that I can lower water pressure if I increase the frequency of the wobblers (but them closer together) or if I lower the risers so that the wobblers are closer to the ground. I'm not inclined to go with an overhead system. I like the mobility and flexibility of the risers I have, but it's worth noting for future consideration (most people prefer the Netfim system from Rainflo). I did increase the frequency of the risers and that helped some, but I'm not sure I've gotten to a final solution yet. I still have some work to do on this one. What is the best software for an alternative CSA model like mine? I have been using Small Farm Central and I like it, but I don't love it. I thought I had found a new, better solution in Farmigo, but I wasn't sure. I wanted more options. So I put the question to the ladies of the "Women in Sustainable Agriculture" group and was amazed at the number of insights I received. Many people confirmed my suspicions about Farmigo and in the end, because of their advice I did not move to this system. They also offered 4 or 5 other solutions that I had never heard about. In the end, I decided there wasn't a clear better option then what I am using, some I'm sticking with Small Farm Central for now. But, I learned a ton in the process and I have a much better sense of what's out there and what I really need from a good software system. I'm sure that as the season heats up I'll have less time to read and participate in these group forums. But, it is so comforting to know that they are out there and that I really do have a community I can access for support even if it is virtual. My new hoop house is almost complete! The construction phase is nearing it's end. The frame is up and gleaming, all of the bolts are tight, the wire lock is secure. All that is left is the plastic. It's amazing how much easier it has been this time around. I guess it shouldn't be a surprise. They have a whole saying about this: "it's easier the second time" (or something like that). But, it's so comforting to actually have that bear out in farming. It makes me almost hopeful that next year could follow the same maxim... is that possible? Could farming not only be fulfilling, rewarding, and the most delightful way to pass the time, but also not kill me? Is that a thing? Eeek I hope so! 1. This house is smaller. It's narrower—only 26ft wide instead of 30ft. It's also shorter. The site for this house is a bit sloped, so to compensate we had to drive in most of the ground posts much further, bringing the total hight of the building down a few feet. It's not much, but when you're teetering on top of a ladder it makes a difference. 2. I'm a lot stronger. This whole farming thing seems to be paying off. The physical demands of the construction have been a lot less taxing this time around. Also, there is something particularly satisfying about the act of swinging a sledgehammer when your muscles are strong enough to not only drive the post, but to also be able to focus on the accuracy of each swing. It's like threading a needle. Eventually anyone can get a string through a hole if one works at it for long enough; but one has to have the skill and precision which comes with practice to get it through every time (or at least most every time :). 3. The directions finally make sense! (At least sort of). Building a hoop house is like putting together a massive IKEA set. All of these pipes and boxes come in a pile on a tractor trailer and each piece has it's own set of bolts and clamps. So the game is to try to decipher the obscure pictures in the large white binder and figure out which steel pipe goes with which tiny bolt. The first time around it was like swimming through a fog of metal—it's so humbling to feel entirely incapable of reading instructions. The second time around you barely even need to look at the pictures. Ahh the satisfaction of experience. Of course, it's dangerous to write this before the plastic is on. That is the final and most important step. And it is possible that there will be so much wind over the next two weeks that I will have to postpone my long awaited vacation in order to get this house finished. But, I'm hopeful that the good holiday cheer will be with us and that the final step will follow the rest of the building and be satisfyingly easy to complete. Please! Let's all cross fingers and think happy thoughts... All I want for Christmas is a hoop house! One of the hardest (but perhaps most important) things I want to do for the farm, is keep track of critical—often game changing—moments of the year. I love my winter spreadsheets and planning documents. But, this year when the season really got rolling and weather/pests/life crises came flooding in, the plans flew out the window. So, on this rainy Wednesday in late October I'm taking the opportunity to crawl through my memory (while it's still relatively fresh) and write down a few dates I don't want to forget for next year. April 15th (part 1). Broccoli will not bring a good harvest in the southern heat if it is planted after the 15th (or maybe the 20th if I'm pushing it). Plantings in mid-Arpil will give you a harvest by the first week in June. After that the heat and the sun will be such that the broccoli heads will turn yellow and bitter. Also at that point the cabbage moths will be in full flourish! April 15th (part 2). April 15th is also the earliest date to plant cucurbits. This is a risky planting because of frost. However, this we found that if the plants make it past the frost you will get a long beautiful first succession before the squash bugs and striped cucumber beetles show up. This year our first cucurbits succession bore fruit for 9 weeks, compared to the next three successions of cucurbits all of which only bore fruit for 3-5 weeks. Redbuds. When the redbuds come into bloom so will the flea beetles. This will mark the beginning of the pest battle. Greens (and almost everything else) will have imperfections from this point until the 1st of October. April 20th. This is the time to start adding summer crisp lettuces to the lettuce successions. After this planting the lettuce will start growing much faster as the days warm up. If successions are kept tightly to 10 days or less you can still keep harvesting throughout the summer. However, oak leaf varieties will not grow to full size before bolting and butter heads will also begin showing signs of heat damage. Leaf lettuces and summer crisp varieties will do the best through the hot months. May 1st-15h. The first two plantings of Spinach in May may or may not make it to harvest. It is worth planting Spinach all the way through May in case the weather is cool (especially the nights), but this is when they will start turning yellow and dying before full harvest size. August 31st. After this point the spinach should make it to harvest. However, it's probably worth starting successions in early to mid August just in case the weather shifts and the spinach makes it in early. This fall though, we lost our first few fall plantings to the heavy rains. It's worth noting for next year that the spinach needs good drainage especially at this time of year. September 1st. This is about the time the light begins to change and we start seeing a real slow down in crop growth. It's worth starting to double up on lettuce plantings the last week or two of August and tightening up the successions into September. 2nd week in September. After this date cole crop plantings probably won't come in for a full harvest in time for the last markets. It's worth having two fall brassica plantings, but I wouldn't plant the first one much before the 1st of September (otherwise it will be too hot and buggy for good growth) but after the second week in September growth slows down and therefore the 50-70 day crops won't make it to harvest for the end of market season. October 1st. This is the latest date to plant greens in the hoop house in time for fall harvest. Spicy greens and Arugula planted October 1st were ready for harvest this year on the 29th of October. Lettuce planted at the same time will not be ready for another 2 weeks (which makes it very marginal for fall harvest). Better to plant the lettuce in the hoop house in early-mid September. Lettuce this time of year will hold much longer without bolting, so it seems better to get larger quantities in the hoop house early. Most likely everything will change next year and I'll have a whole new set of dates to remember. But, hopefully some of these will make it into the lessons learned category and help increase production next year. Last night we had the first frost of the year. It wasn't a hard frost: our remaining outdoor crops were protected by row cover, and all in all it was relatively uneventful. It did however provide a kind of punctuation mark for this season. At this point, nothing more will be planted, we won't see too much more growth. Essentially, what we have is what we will have for the remaining weeks of harvest. So, what's next? This week's blog is an initial catalog of some upcoming projects and a loose schedule of things I'm hoping to get done between now and the end of the year. First and foremost.. finish strong! We've had such a great first year at all of our markets and with all of our farm share members, I really want to make sure everyone ends the year on a high note. The last few weeks have been a little light on produce—some of our plantings were hit pretty hard by the flood. That two week period of rain also really brought a transition in the amount of light plants are getting and therefore the speed of growth I've been seeing in the successions. BUT the good news is, we have several new beds of greens that will be ready and beautiful for the last 5 weeks of harvest. We will also have my two fall favorites in abundance—broccoli and spinach! Clean up, clean up, everybody clean up! The frost put the nail in the coffin of the outside tomato beds, so we have a few hundred plants to pull, stakes to remove, and plastic mulch to take out of the field. We also have a number of old salad beds etc that have been left to the weeds (which the frost killed too!). These beds all need to be cleared and reworked in preparation for winter. Building projects galore. Guess what? It's finally time to finish putting the roof on the cooler :) We weren't able to finish that project last spring and the tar roofing has held up very well, but it's time to put on the finishing tin. It is also time to get a door put on that building. The open air entrance was convenient for summer, but now it's time to get the room insulated and protect the plumbing for winter freezes. Hoop house construction and maintenance. It's time to purchase a new hoop house! This tomato house will be full of tomatoes, peppers, and basil all season :). But, it is also time to give a little "tlc" to our current hoop house and heated greenhouse. The plastic on the big hoop house needs to be tightened and one of the rollup sides has come unscrewed. The heated greenhouse needs to be re-insulated with dirt and gravel around the baseboards, and we need to dig out the "wiggle wire" to seal the walls and get ready for making heat! New toys and beautiful beds! So, long and short, I don't want to play that game again next year. This fall we're doing things differently. I got a new toy! Check out this beautiful bed-shaper from Buckeye Tractor company. It has large discs that can pull heavy soil together in to a rough raised bed. These raised beds can then be amended with compost and planted with a light cover crop. With this set up, after over-wintering, the tilth of the top three inches of the raised beds should be such that we will be able to work them in the spring even in wet conditions. I am so excited about this new bed system. It feels like we are building toward a land management system that will be good for the soil and good for the business. This giant step forward would never have happened without my father. He helped me think through the necessary equipment. He did the research to find the best place to purchase the bed-shaper. He worked the land on Thursday afternoon while I was at market. He made it possible to get the land worked in time for cover cropping and before the cold damp ground becomes yet again intractable. I really can't even begin to express how lucky and grateful I am to have his support and partnership in this business endeavor. Thanks dad! Our farm share program is so fun. I know that sounds self-aggrandizing, but seriously, I love our members and the community we are building. Getting to know our farm share members (especially the little ones :) has been the most rewarding part of this season. 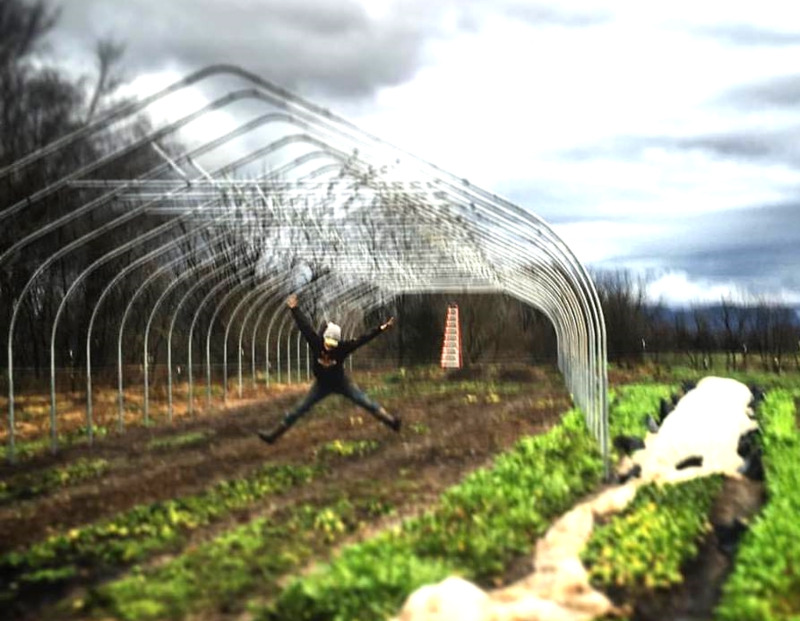 The farm share program is the aspect of the business that is the most fun to dream about, has the most compelling narrative, and really makes me the most excited about building a vibrant community around healthy food and sustainable agriculture. As such, I'm dedicating the blog this week to a reflection on the attributes of the farm share program that I love and some thoughts about how it may evolve next year. My hope is to get enough information together about the program while this season is still going (even on top of the endless harvesting and farm work going on around here!) to be able to build the program for next year before winter sets in and everyone has forgotten the sweet fruits of summer. Choice! With the debit-style farm share model (members place their own individualized order every week rather than receiving a traditional one-size-fits-all box) I never worry about whether my members are getting the food they want (too much, too little, too many squash, too few tomatoes etc..). The central component of the program is our online store where members select their own produce for the week and design a menu that fits the needs of their individual family. This customization is essential. Flexibility. There's no pressure. In our program farm share members order whenever it is convenient. Our online store is updated daily and members can order anytime up to 24 hours before their chosen delivery date for the week. Members can skip a week if they are going on vacation or double down and pick up twice in a week if they're are on a veggie bender. The world is your oyster (or tomato) so to speak. Community. Being a part of the farm share program gives members an intimate connection with their food and their farmer. In addition to seeing and chatting with me every week, we've also had the chance to bring members out to the farm and give them a first hand experience of what it takes to grow healthy food sustainably. With our weekly newsletter and blog members (and some interested non-members :) are plugged in to the challenges and joys of sustainable agriculture. AND our littlest farm share members are the cutest! I love bringing kids into the world of farming. The community aspect of our farm share program is what I'm most excited to build on in the coming years. Customization is expensive. I built this debit-style farm share model a bit naively. I did not accurately budget the time, labor, and materials necessary to pack 50 individualized shares every week. Not only did I not include funding to support the customization in the cost of the farm share ($300 per family), but I also offered a 10% bonus just for signing up. A 10% bonus value makes a lot of sense when your price point is higher (traditional CSAs are usually $500-600 a year) and when you're only offering a basic share of what you produce (a million squash in July). However, it does not make sense with this model where everyone has the same choice as they would at a farmers market and it's washed, packed and delivered on request... In the coming year the cost-effectiveness of our farm share model most be addressed in order for the business to succeed. New exclusive Farm Share Member benefits. To add to the value proposition of this farm share membership and to focus on the community building aspect of the program (my favorite part!) I'm planning a number of new farm share member-only benefits. Some of these will be free and included in the initial cost, some will be optional add-on expenses. Additional farm resources, recipes and online information. Monthly "hands-in-the-dirt" days during the summer (don't worry, it won't be very hard :). This would be a one-day-a-month open farm day for families to come, dig potatoes, pick beans, harvest tomatoes, or any other myriad of fun farm jobs that would give people a brief window into the life of their food. Farm camp. I know I've mentioned this before, but it's just because I love the concept! It will be a half-day week long camp open to children of farm share members and will include activities like seeding lettuce, picking tomatoes, tending the chickens and learning about plant life-cycles. More learning and resources. I'm working on putting together a book of recipes and nutritional information for each of our crops. This is a winter project, but I hope to have it done in time to share with farm share members next year. It will include background information about the different varieties of vegetables we grow, what their life-cycles are like, and how best to enjoy them in the kitchen! What are your ideas? I'd love to hear from you. How would you like to engage with the farm next year? Email me! Long and short, this is all a work in progress. I love the farm share program, I'm excited to see it grow, it has to be financially viable, and I want your help making it amazing. Are you with me? Just say yes :) Oh and sign up to be on the waiting list here. (Current farm share members get first choice but we have plenty of room to grow). We are in the black! Who knew a farm could make money in the first year?? (Admittedly, not very much, but hey, it's still a good start). People love the farm share. We have a waiting list of over 20 people and we haven't even started advertising for next year. But here's the thing, it could be SO much better. And it WILL be so much better. As the season changes and I feel the coming of the end of the year, I'm suffering from a common entrepreneur syndrome: pre-emptive transition. We're only 75% of the way through this season and I'm mentally already on to next year. I'm frustrated that I can't do anything to change or boost the rest of this season (everything that can be planted has been, decisions that were made three months ago can't be changed now, etc.) and I'm ready to make next year AMAZING. What was I thinking with the potatoes?? How could I possibly have thought that 30 lbs. of seed potatoes (fingerlings no less!) would be enough to feed a fifty member CSA and a robust market schedule?? NEXT YEAR we're planting an entire field of potatoes. I'm purchasing a minimum of 150 lbs of all different kinds of seed potatoes, and our crop will be so bountiful! What happened to the peppers?? I LOVE peppers. I was so excited for our pepper crop. BUT (a) I didn't plant enough in the first succession, and (b) most of the first succession just died. They just turned yellow and died without pattern or clear cause. We did manage to plant a second succession in the hoop house that looks beautiful. But, it was late going in and now I'm stuck chewing my fingernails waiting, waiting, waiting for the peppers to be ready. I'm about to break down and sell green peppers. I know people love green bell peppers, but they're not as good as really ripe red peppers...I promise, they're really not as good. NEXT YEAR I am going to have many beautiful long successions of peppers and they will all be undercover and protected (hopefully!) from the disease/wet feet problems. We need more onions! I tried hard with the onions. The ones we got were actually really good. BUT onion maggots are a real problem in the south. If we had been able to keep all of the onions we grew we would have had plenty for this year. BUT we lost about 50% to the maggots :( NEXT YEAR we will have more onions. I will just keep planting more. Also, we did discover that two varieties (Ailsa Craig and Cabernet) were much stronger than the other two varieties we tried, so we will plant more of those! There are many, many more things I want to change and do better for next year, but this list will hopefully address some of the late-summer/early-fall lull that we're feeling now. FARM CAMP!! I know everyone thinks I'm crazy, but I'm really looking forward to spending a week next year teaching a bunch of bright-eyed kiddos how to hunt for eggs, pick cherry tomatoes, dig potatoes and so much more! Full-time help. Can you imagine? What luxury! Year-round greens! With two hoop houses and a full time staff member this is well within reach for next year. How great would it be to have a fresh, local greens in January?? An on-farm store. We have a beautiful old cannery building on the front part of our property that I think is perfectly suited for an on-farm store. It must be admitted that dreaming about the future and the community we get to build here is really one my favorite parts of this job. I feel so lucky and excited to have the opportunity to carry out all of these big plans and watch as the farm evolves in to a vibrant, local hub of good food and good people. Fall is coming...(queue dramatic music. dun dun dun.). 1. It's not as bad as they say. True, summer is coming to an end. But also true, the veggies are awesome in fall! We still have all (or at least most) of the goodies from summer (tomatoes, squash etc) and the greens are back to being fabulous! Plus there is winter squash on the way and broccoli! Morning harvests are cool, everything looks beautiful in the early fog. dew sparkles of the dark green of greens regaining density as they grow more slowly in the cool weather. 2. Vacation is just around the corner. I have been doing my best avoiding too many day dreams of vacation. I LOVE summer and I know I will be SOO sad when it is cold and brown, so the last thing I want to do is wish it away. But, let's be honest, this farming thing is a LOT of work. I am looking forward to taking a vacation (that's allowed right?). So, fall says to me: "Hey guess what lady, maybe you don't have too work so hard, the days are getting shorter there's no more planting to be done and soon you're going to be on a beach somewhere far from here." 3. I'm winning the war. The bugs are going down. Nature is running it's course and the myriad of pests feasting on my veggies will die! (I mean they have to right?). I still have a ways to go on this front. But, I did find an awesome solution in the form of Protect Net. This miracle product is cooler than reman but just as effective at keeping the flea beetles off of the greens. So FINALLY my precious arugula and spicy greens are back to their lovely selves - no holes! 4. Time to get excited about next year! I have trouble resting on my laurels. My brain is already turning to plans for next year. Perhaps what I am looking forward to most over the next two seasons is time to plan and dream! One my short list: figure out how to prepare next year's spring beds in the fall so they will dry out early next year, research a new farm share management tool, create new marketing materials for South Roanoke and our Sweet Donkey market, read up on new flower varieties, figure out how to get all of the farm paperwork online - Thornfield Farm is going mobile! etc, etc.. The list is long, and I certainly don't want to rush summer out the door—I will miss these long summer evenings so much!—but I'm excited about this new chapter in the farm year and as I watch the school buses rumble by I know it's about that time.. It may still be mid-summer, but my head is already exploding with plans for next year. Today we broke ground on the site of our expansion field. This new piece is about a half an acre of flat bottom land on the front part of our farm. Here are some of the pluses and minuses about this new land (at least as I see it now -- we can be sure this list will evolve next year!). In the plus column: (1) it is one of the only flat pieces of land on the farm. This makes it easier to form beds and work the land. (2) It is already certified organic! Our neighbors have been using this land to graze horses, so we were able to get it included in our inspection this year and now it is all ready to go! (3) It is relatively close to our barns and water source. One thing that I have learned this year is how much time I spend moving in between fields--ferrying crops, changing irrigation etc. So having our fields in close proximity definitely helps increase efficiency. (4) There is less clay and more loam in this field. The organic matter is relatively high (particularly compared to some of our other fields!). This (hopefully) will make working the land easier. In the minus column: (1) Several large hills drain into this field so we have to work around the natural waterways. When tilling this weekend we divided the field into sections with a winding waterway crossing through them. This will make the beds a little less regular, but hopefully will allow us to avoid flooding. (2) Also because it is bottom land it's cooler so it probably won't dry out as quickly as some other fields making it potentially challenging for early spring work. (3) The best access point is actually off the state road. This isn't necessarily an issue except we'll have to keep our eyes out for traffic and try not to be too much of a menace to our neighbors.